Mr. Kaspar Korjus (30) is helping nations to transform to borderless digital societies. Currently as Managing Director of Esotnian e-Residency program, built on inclusion, transparency and legitimacy to empower citizens globally and to achieve world-wide digital and financial inclusion. Kaspar is listed by Forbes Estonia `30 under 30´ people as #1 in Technology and Finance and elected by US CTO Megan Smith as one of the 20 global digital leaders. 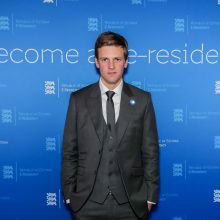 Kaspar is also the founding curator of World Economic Forum Global Shapers Community in Estonia and from 2017 has been globally the most cited spokesperson of Estonia.